According to Wikipedia, Ballig on the Isle of Man "...is the site of a former notorious hump-back bridge used for the Isle of Man TT Races on the primary A3 Castletown to Ramsey and the road junction with the A20 Poortown Road in the parish of German in the Isle of Man. The former Ballig Bridge was part of the Highland Course and Four Inch Course used for the Gordon Bennett Trial and Tourist Trophy automobile car races held in the Isle of Man between 1904 and 1922. 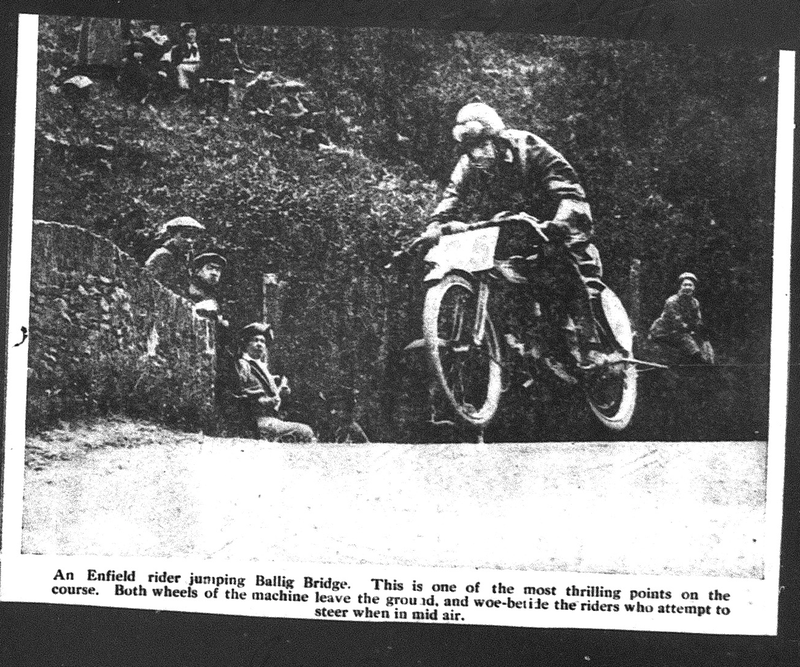 Also, Ballig Bridge was part of the St John's Short Course used between 1907 and 1910 and part of the Snaefell Mountain Course used since 1911 for the Isle of Man TT Races and 1923 for the Manx Grand Prix." The humpback bridge was removed in 1935 and the road straightened. The above picture is from 1914. This is what it looks like today.